The story of Richard van As and his Robohand continues to make national news. Richard van As was just another carpenter living his life and doing what he loved, until two years ago, while working with a saw he tragically lost four of his fingers. Amazingly, rather than dwelling on what had just happened, Richard was somehow able to set to work to solve the problem. Like many, Richard scoured the internet for prosthetics that were affordable as well as useable – but didn’t find anything. Then, Richard happened upon a video posted online by mechanical effects artist Ivan Owen of Washington. Richard contacted Ivan and teamed up with him to create a low-cost prosthetic hand. In January 2012, Robohand was developed. Robohand is a prosthetic robotic hand that uses 3D printed components. It’s open source, so anyone with access to a 3D printer can create hands, fingers, and now arms as well. Since January, Robohand has continued to rapidly grow in popularity around the world. In fact, according to Van As, there are only three countries that have yet to print a hand! 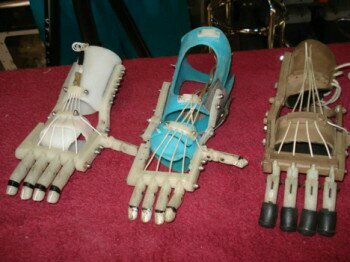 Robohand strives to keep all of the prosthetics affordable. A full adult hand costs as little as $2000 to create. Robohand operates under a “pay it forward” program. Since many of the 3D printed Robohands are printed in the US, where $2000 is considered affordable for most, many are “paying it forward” to another on the waiting list. Richard says their next step is to be able to print prosthetic legs, and from there they hope to print exoskeletons, making it possible for paraplegics to walk once again. The remarkable story of Richard van As and Ivan Owen continues to develop, as 3D printable prosthetics help change the lives of tens of thousands of people around the world. An inspiration of the remarkability of the human spirit and another demonstration of the potential that 3D printing holds.